HAZELWOOD, Mo. -- When Ty Rattie arrived for his orientation visit with the St. Louis Blues last summer, it was no different for him than the majority of the prospects witnessing life in the NHL for the first time. "It was sort of like starting school for the first time," Rattie said. "You didn't know what to expect and you're obviously nervous." Rattie, chosen by the Blues in the second round (No. 32) of the 2011 NHL Draft, comes into his second summer working with Blues strength and conditioning coach Nelson Ayotte this week at the St. Louis Mills Ice Zone brimming with confidence and eager to elevate the impressive numbers he put up in the Western Hockey League last season. The 19-year-old ranked third in the WHL with 57 goals and 121 points. He also led the league in playoff goals with 19 in 21 games, and his 33 points were second -- helping the Portland Winterhawks advance to Game 7 of the WHL finals. Having been through the initial process of becoming an NHL player, Rattie will continue to try to prove the skeptics wrong. Those same skeptics say the 5-foot-11, 170-pound right wing is too small to become an effective player at the NHL level. 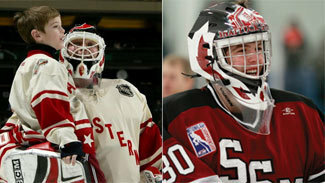 Another Brodeur drafted in Jersey? "I thought I had a really good year," Rattie said. "Our team came one game short in Game 7 there, but personal-wise, I was really happy with my year. Hopefully I can keep going with it next year. "The biggest thing for me was skating and I thought I really improved that. Now I'm just trying to put on weight. I put on about 6 or 7 pounds at the end of the season. I'm on the right track. That's the biggest thing for me right now, just getting bigger and improving my strength." The Blues have kept a close watch on Rattie and they like what they have seen. "Obviously, if you put up those numbers, you're doing something right," director of amateur scouting Bill Armstrong said. "What you look at is as a scout and try and project, is he capable of producing those numbers at a higher level? With him, he's got the sense and the feel and the ability to make plays offensively, thinks the game at a very high level. As far as strength-wise, he's still a ways away from the NHL. Size and strength and speed will be his biggest adjustment as a player coming in. So he'll have to do that. His brain obviously thinks the game very fast. Now it's his physical ability with the strength, which will take some time to get there. "He's got to work on playing a complete game, I think. But that's time and maturity. It takes a little bit of time to get in there. He's one of those kids, he's got a raw body type, so he's going to have to put some time in to getting bigger and stronger." Blues director of player development Tim Taylor, a veteran of 13 NHL seasons, said he's noticed an increased effort by Rattie when it comes to putting in the necessary work. "I think his work ethic has changed a little bit," Taylor said. "Young players have to learn that it takes a lot of hard work and dedication. It's not just the talent that takes over. You need to put everything together to be successful." Rattie, who had 28 goals and 51 assists in 2010-11 with Portland, seems destined for another season in the WHL. But first, he hopes to attend training camp with St. Louis and make a lasting impression on his future employer. Rattie hopes the next step would be getting to the American Hockey League and the Peoria Rivermen. "I'd love to get to the NHL as quick as possible," Rattie said. "That's everybody's dream, but I know I've got a lot of work ahead of me. I'm pushing and I want to be there as quick as I can. "My goal is to be here for camp, and it would be a dream come true to make it to the NHL."